Home » Events » Happy Birthday Bryce! Last year Bryce Hill, who has autism, turned four and no one came to his birthday party. This year, the Albany County Sheriff Department Project Lifesaver joined forces with local fire departments to make sure Bryce had an exceptional fifth birthday! Bryce was escorted to Menands Fire Department by the Sheriff’s Department to an out-of-this-world birthday party. 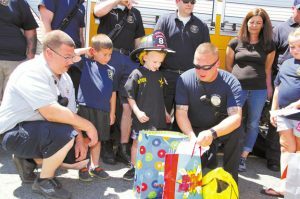 Members of Menands, Schuyler Heights, Colonie Village, Shaker Road-Loudonville, Albany County Sheriff’s Explorers and Menands Police Department gathered with gifts and birthday wishes for little Bryce. Chief Gerald Paris came to meet Bryce, as well. Menands Police Department created a motorized police car for Bryce which he fell in love with, and a bouncy house highlighted Bryce’s day. Bryce received turnout gear and a helmet from the fire departments. Nothing could have been more special than the look on Bryce’s face when everyone sang happy birthday to him. Everyone went above and beyond to make sure Bryce Hill turned five with a lot of special memories.